I love Pad Thai and recently when I was in Boulder at a restaurant called Leaf for an amazing dinner with So Delicious, and some fellow bloggers, I had a delicious Spaghetti Squash Pad Thai. I immediately thought of Crunchy Yam Noodles with Spicy PB Sauce I use to make all the time. So naturally when I got home I was still thinking about it and had to whip some up for dinner one night, and then again, and well umm yeah you know again. Yes I am aware that was only a few weeks ago! Even making double batches so I had leftovers. It’s great for a quick weeknight dinner as you can whip the sauce together while the spaghetti squash is cooking in the microwave and it’s ready in less than 30 minutes! It’s good cold for lunch or you can even eat it topped with a poached egg for breakfast. I made it without adding any protein but noted below you can add tempeh, chicken free chicken, or protein of choice if you want. I thought it was great as is and debated on calling it Plant Based Pad Thai so that’s why I left it out this time. I even had another twist but thought my family might not be happy if I made it again just to top it with something else but there’s always next week, or next month, and trust me there will be a next time! Have you ever been inspired to go home and recreate something you ate at a restaurant? Ever go out and eat something you have all the time but with a twist and wonder why didn’t I think of that? Don’t forget it’s Meatless Monday! 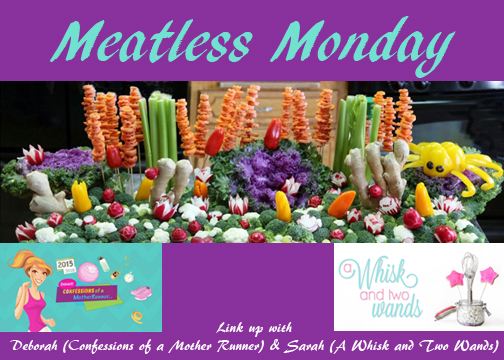 Link up with Deborah and me if you have a meatless recipe to share, or find more Meatless Monday inspiration below! You can add protein such as tempeh or Beyond Meat Chicken Free Chicken if desired. *Adjust heat as desired using more or less spicy peanut butter to total 1/2 cup, for kids and those who like it less spicy I would go with 3 parts regular peanut butter, 1 part spicy instead of half and half. **I’ve been making double batches as the leftovers are great cold for lunch and use 2 squash, 2c peppers and carrots, 1 cup of peanut butter (half and half if making it spicy and 1/4c spicy to 3/4c regular for the girls), 1 box (11oz) So Delicious Light Culinary Coconut Milk, 1 tablespoon coconut palm sugar, and 3 tablespoons of liquid aminos/soy sauce. To make this dinner quick carefully cut squash in half, remove seeds, and cook cut side down in a microwave safe dish with a a little water in the microwave until tender checking after 7 minutes, cooking until tender. Time will depend on the size of your squash and your microwave. Here is a good video and instructions on cooking in the microwave. Alternatively you can cut in half, remove seeds, and bake it in the oven 450F cut side down for 30 minutes or until tender. While the squash is cooking in a large skillet whisk together peanut butters, coconut milk, coconut palm sugar, and soy sauce on low heat until smooth and combine. When squash is done cooking slice in half and scrap out seeds. Scrap the squash with a fork and add squash noodles to the warm sauce. Add in peppers and carrots and toss together to coat everything. Plate and top with cilantro and peanuts and serve with a lime wedge. Enjoy! Spreading and sharing in the Meatless Monday love I’m also linking up with The Fit Foodie Mama and Running on Happy! Thank you Angela! 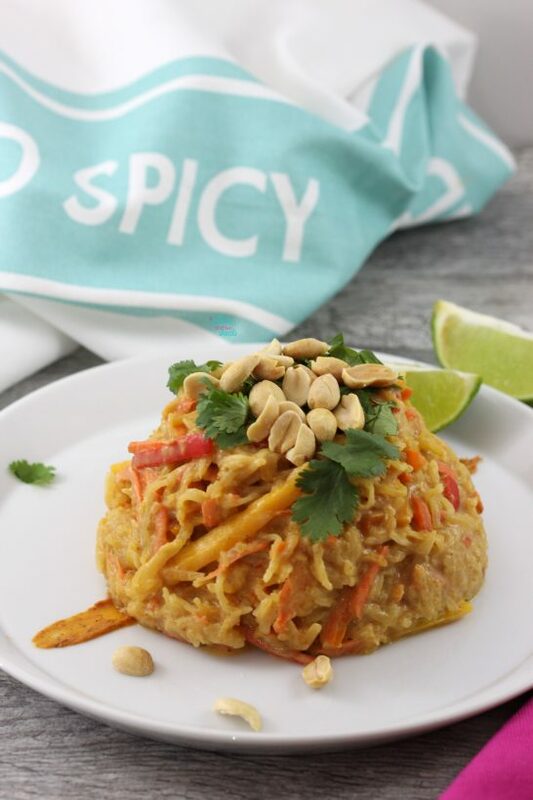 This would be a much healthier option than traditional Pad Thai, I hope you enjoy it if you make it! This sounds ahhhhmazing! Actually, I have a spaghetti squash waiting to be used, and I LOVE Pad thai, so this was perfect timing! YUM!!! Happy Monday friend! Thank you Tina! I hope you love it as much as I do, let me know what you think! It looks so creamy! Love that you used the spicy PB co! Thank you! I like mine with a little more sauce, which in this case makes it so creamy, and especially delicious when enjoying leftovers, I mean planned overs, cold! Wow wow wow this looks awesome! Pinned- cannot wait to give this a try! Thank you Annmarie! Let me know what you think if you make it! Come on over for lunch, it’s a fav so I will gladly make it for you! Cheers to Meatless Monday! This is genius. Totally making this with almond butter! Thank you Nicole! Let me know how it turns out with almond butter, and what spices you end up using if you add any to spice it up! Pad Thai is one of my absolute favorites– this looks incredible! Ok so I was literally just talking about squash with my 6 yr old. We came to the consensus neither one of us is a big fan BUT this recipe may change our minds. Mine, at least. Great idea. I can’t wait to try this! Not a fan of spaghetti squash, well I hope this changes that… keep me posted! For kids if they don’t like a lot of spicy you can easily tame it or just use peanut butter which is just as delicious hot or cold! OMG that peanut butter… i die. So good in this. Really my fav kind of meal, with a little HEAT! I can’t wait to make this! I love pad thai with lots of Sriracha. Thank you, hope you enjoy it Cassandra! 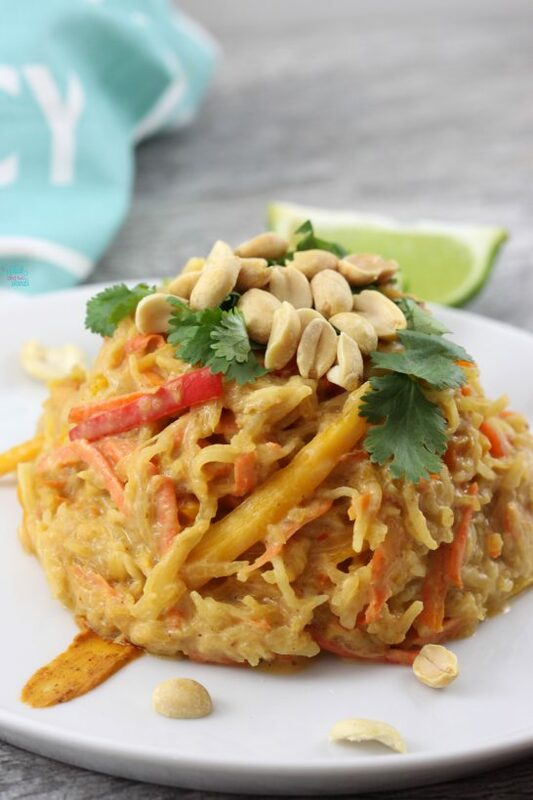 Love spaghetti squash and pad thai… got to try this one out! YES! I just made a quick version for lunch with leftover spaghetti squash today for lunch, I just can’t get enough! 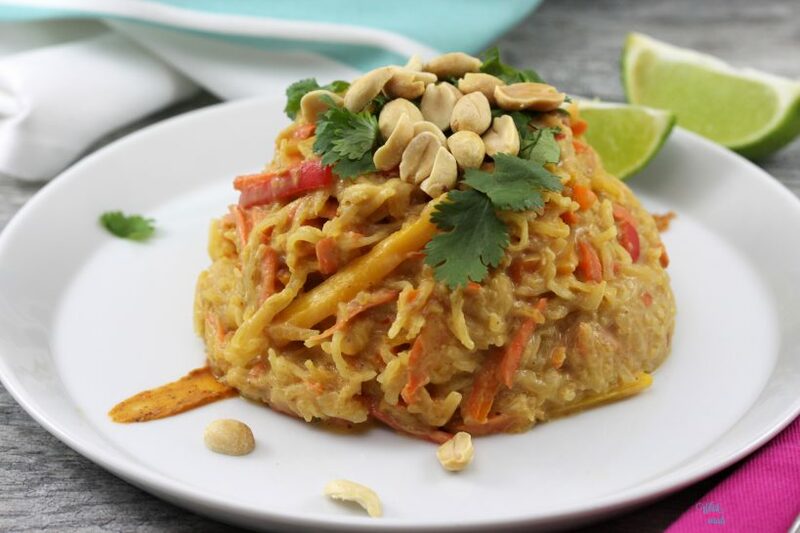 Mixing spaghetti squash with peanut butter… Interesting! Very interesting! I love pad thai. I did one with peanut flour and shirataki noodles a while ago. I really love that you got to use spicy PB in this. Gotta get my hands on this! I don’t think we have peanut butter & Co brand in Canada. What other brands would u suggest for spicy peanut butter?